Bothered by my Green Conscience (hereafter Bothered…) is a series of visual essays — five to be exact — about Franke James’ journey to the green side. 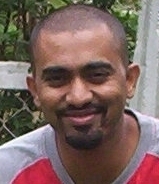 In the beginning of the book, Franke comes up with the big idea – Do the hardest thing first, before you change your mind. The hardest thing that the author did was to give up her SUV. Then, since she didn’t need her driveway because she had no car, she took on the city of Toronto and got the first permit to build an eco-friendly driveway in Toronto. Her driveway is now a converted garden with plants and trees and more importantly less stormwater runoff. Reading the essays makes you wonder about the things that you can do to make your life more sustainable and green. Even though I had read all of the visual essays online, reading the essays in Bothered… was a totally different experience and the essays were easier to read. I also didn’t appreciate how much work goes into creating each visual essay until I saw the illustrations on the pages of the book. The visuals that Franke James uses with her words are way more powerful in conveying her experiences and thoughts than any book with only words could be. As soon as I finished the book, I wanted to give it to my family members so that after reading it, they’d understand why I use baking soda for cleaning, why I segregate garbage, etc. In fact, Bothered… is one of those books that you feel like giving to everyone you know so that they can also get the “green thing”. 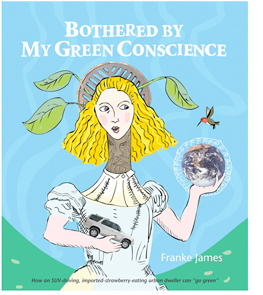 Bothered by my Green Conscience is a terrific read and unlike any book that I’ve ever read. I wish and hope that more people will read it.